For more information about Decentralized Systems (Individual Room Systems), please review Article " Air Conditioning System Configurations – Part One ". Packaged air conditioners with air cooled condensers. For more information about Semi-centralized systems (packaged systems), please review Article " Air Conditioning System Configurations – Part Two ". Roof top packaged units (RPU) are an all in one air cooled A/C unit that are installed on top of the roof and can provide cooling and heating. The condensing unit and the air handler reside inside a single housing. In order to connect the unit to the inside duct work, an opening on the roof for supply and return air is necessary. The duct work distributes the air evenly through-out the space. Heating can be provided by reversing the condensing unit (heat pump) or connecting an electric heater, gas heater, or steam coil. Indoor package units (IPU) are similar to rooftop units, but because the unit is located inside, it requires a different way of cooling the condensing unit. The most common way, is air-cooled using louvered openings (horizontal angled slats that prevent outside weather to come inside, but allow air flow) to get fresh outside air. In situations where there is no access to fresh outside air, water cooled units are the best solution. Indoor units come in vertical, or space saving horizontal configurations. These units are the same as roof top units in the way they connect to duct work and have the same heating options as mention in the roof top packaged units. Ductless (wall mounted, ceiling suspended, ceiling cassettes, and floor standing). You may also have multiple air handlers connected to one condensing unit in computer controlled split systems. Air Conditioning System Configurations – Part Two. Air Conditioning System Configurations – Part Three. Central air washer (central evaporative air) cooling systems. 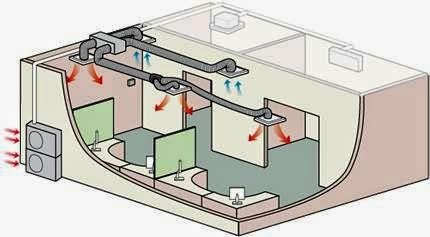 For more information about Special systems, please review Article " Air Conditioning System Configurations – Part Three ". Reciprocating compressors are driven by a motor and use pistons, cylinders and valves to compress the refrigerant. Reciprocating compressors are usually used in smaller systems up to 100 tons. Open type (Direct driven) Motor-Compressor. A combination consisting of a compressor and the driving motor, both of which are enclosed in the same welded steel casing (housing) and the two are connected by a common shaft with no external shaft or shaft seals. This makes the whole compressor and the motor a single compact and portable unit. But since the components (compressor and motor) are not accessible for repair, the entire compressor unit must be replaced if it fails. It is widely used for the refrigeration and air conditioning applications like the household refrigerators, deep freezers, window air conditioners, split air conditioners, most of the packaged air conditioners. It is used with motor power requirements from 1/20 (for small refrigerator compressors) to to several hundred HP (for centrifugal chillers). With cooling capacity for one single unit about 10 ton but if more cooling capacity is needed, several hermetic motor-compressor can be installed in the same air conditioning unit. The smaller motors up to about 3 HP are usually of single phase design, while larger motors are invariably three phase. Lubrication is also simplified since both the motor and the compressor operate in the same closed space with the oil. The shaft is shorter and more rigid, the bearing arrangement is simplified, the machine is quieter. They are not a field serviceable. Therefore, if a motor burns out in a hermitic compressor, or any other internal problem occurs, the maintenance trend is for a complete replacement of the unit. Otherwise, the entire unit must be returned to the shop or factory to be dismantled and reconditioned. Semi-hermetic Motor-Compressor is similar to the hermetic type but have a removable cover bolted on to the end of the casing to facilitate occasional maintenance. The motor is also part of the unit, however it is not sealed. So, Semi-hermetic compressor is almost completely accessible. Welded, hermetic machines are used for the smaller duties, up to about 70 kW of refrigeration and bolted, semi-hermetics are used for larger loads. Packaged, water chilling units having multiple, semi-hermetic compressors are used with capacities up to about 700 kW of refrigeration. Semi-Hermetic compressors can be taken apart to do maintenance work or re-built a number of times if necessary giving a much longer service life. Semi- Hermetic Refrigerant compressors are direct drive and hermetic sealing. Open type of Motor-Compressor in which the compressor and the motor are different entities and the compressor is driven by external power source, such as an electric motor, an engine or a turbine through a direct coupling or a vee-belt. Power shaft protrudes through the compressor housing and seal is required to prevent refrigerant from leaking out of the compressor housing. Motor is cooled in a conventional manner by air that is drawn in from the surrounding. Open Type (direct driven) Motor-Compressors use as an older technology (The motor and compressor are separated by a flexible coupling), so they are not commonly used today. The capacities for Open type of Motor-Compressors vary from a fractional ton to 400 ton in a single machine. Open systems have motor separately connected to compressor. Not connected with refrigerant and oil charge in the system. Any problem in motor affects refrigerant charge and oil charge. Compressor being open design, can be inspected / opened by just closing the isolation valves. No botheration of removal / loss of refrigerant gas. Motor and compressor are in the same casing. Maintenance at site in case of hermetic is impossible and very difficult for semihermetic machines. Some of the internationally well known brands recommend opening of semi-hermetic also only at the factory / service centre and not at site. Since these can be attended to at site, down time is very minimal. If the compressor has to be taken to factory, long unavoidable delays will result and disrupt complete cooling. Since motors are outside the refrigerant environment, wide choice of makes and type possible. Hermetic compressors are not a field serviceable. Motor windings are cooled by ambient air. Motor windings are in the refrigerant vapour surroundings. Open machines are costlier compared to hermetic. Hermetic machines were basically introduced to reduce manufacturer's first cost. Motor is smaller and cheaper as it is cooled by the refrigerant. Copper and iron content are about half that of an open design. 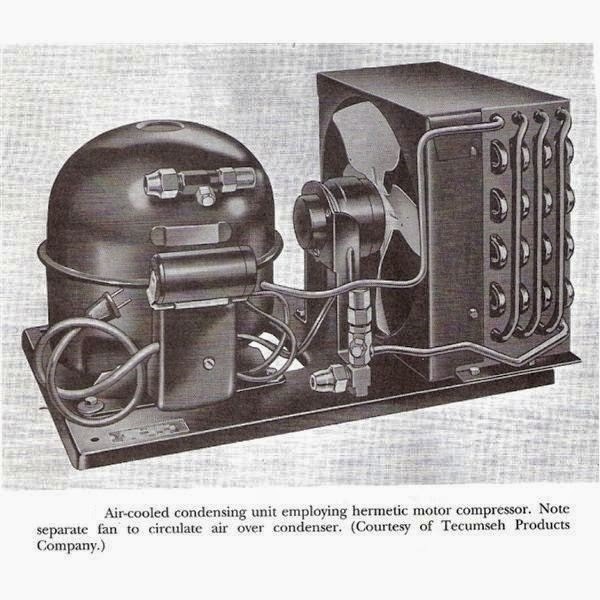 Hermetic motors consume cooling energy produced by the refrigerant. These vapours are to be compressed by the same compressor; Hence, effectively some cooling capacity is lost in motor cooling itself. Open system is about 10% more efficient considering loss in cooling motor and penalty in power for compressing vapour. Net effectiveness of cooling capacity and power consumption is about 10% poorer due to hermetic / semi-hermetic design. Open motors are more efficient as they are cooled / ventilated by ambient air. Hermetic motors are less efficient as they are cooled by refrigerant and are loaded beyond peak efficiency point. These motors are rotating in a much denser refrigerant atmosphere and have higher windage loss. Power fluctuations are not highly detrimental to open motors. Power fluctuations and electrical transients can produce a flash in the refrigerant atmosphere, which can break down into carbon, fluorine, chlorine etc. and will be carried into the system. When combined with moisture, hydrochloric and hydrofluoric acids are formed which can cause large – scale contamination. Insurance premia charged for open systems is much less as the damages are not catastrophic and not for long. Hermetics will take very long before they are put back into operation, hence the insurance companies charge much higher premium as the refrigerant and oil invariably need to be replaced. Overall maintenance is very fast, quick and without any problem on refrigerant side. Heavy maintenance in case of burnouts such as cleaning, flushing, vacuumising, pressure testing and recharging fresh refrigerant and oil. The refrigerant NH3 is very cheap (economical). HFC refrigerants are very costly and cannot return to soil if leaked. ODP and/or GWP problems are plenty. Oil being heavier than refrigerant, can be drained easily even during running. Oil is partially miscible and oil recovery and maintaining the oil level is a big problem. Scroll compressors features two involutes scrolls, one stationary and one orbiting around the first. This movement draws gas into the outer pocket and the gas is forced toward the center of the scroll, creating increasingly higher gas pressures. The upper limit of the refrigeration capacity of currently manufactured scroll compressors is 60 tons. Screw compressors are based on a mechanism made up of two threaded rotors (screws) that are coupled together. The gas is compressed due to the progressive overlapping of the lobes, causing a reduction in the volume occupied by the gas. Continuous and step-less capacity control is provided by moving a sliding valve toward the discharge port, which opens a shortcut re-circulating passage to the suction port. Tons of refrigeration (TR): A refrigeration ton is equal to heat extraction rate of 12,000 BTU's/hr; therefore a 3 TR chiller can remove 36,000 BTU's/hr. hermetic Motor-Compressors is widely used for the refrigeration and air conditioning applications like the household refrigerators, deep freezers, window air conditioners, split air conditioners, most of the packaged air conditioners. Semi-hermetic Motor-Compressors are used with Packaged, water chilling units having multiple, semi-hermetic compressors with capacities up to about 700 kW of refrigeration. In the next Article, I will explain Electrical Wiring for different Air-Conditioning Systems Types. So, please keep following. Found it very useful and informative. Thanks.